There are some mushrooms that you can seek out in the forest without a lot of intricate knowledge. 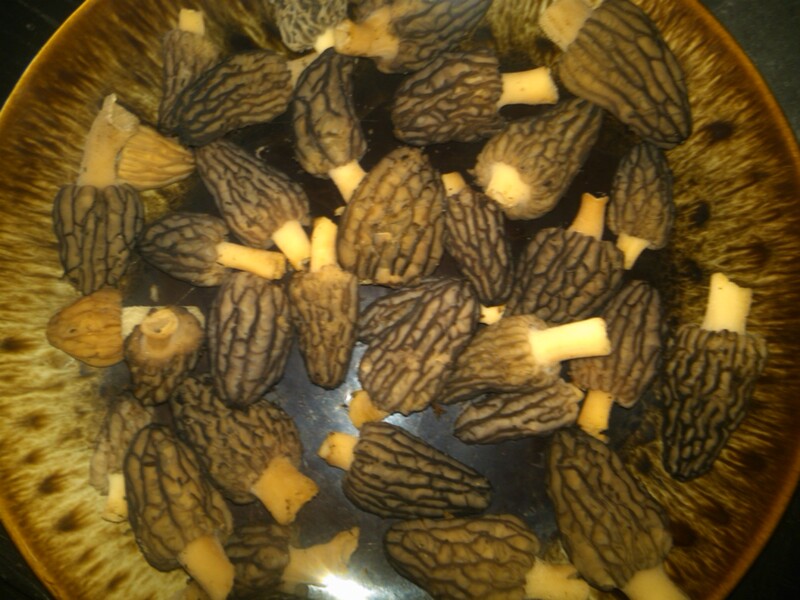 They are known as morels and are highly prized, expensive, earthy, delicious gifts of food from the forest. They grow near rotten stumps or fallen trees, around old apple orchards, elms, sycamores, poplars or even in the old road beds. 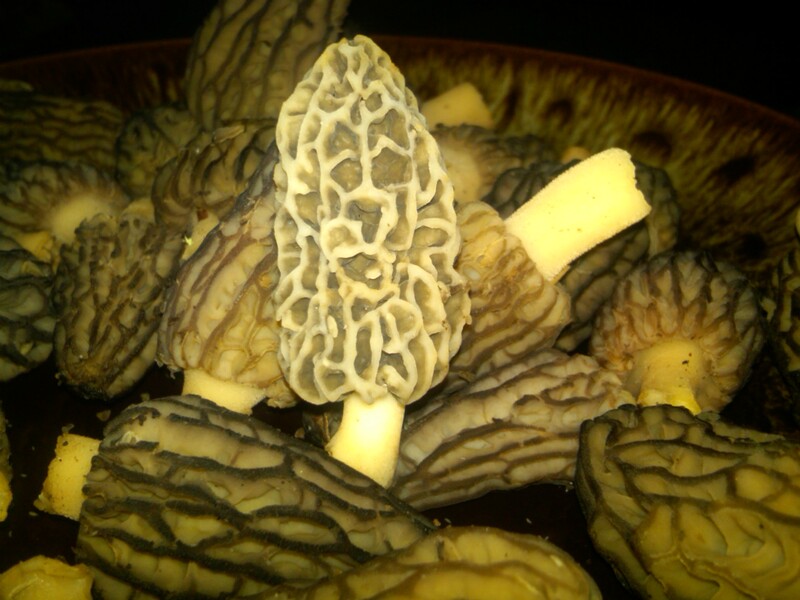 And if you are lucky enough to have a spot that can be trusted to deliver the tasty morel morsels, then you are probably keeping your location secret. It’s as treasured as a prolific fishing hole, and often is even referred to as ‘dry land fish’. Depending on where you live, the season can span from April to late May. Usually when the fern’s are starting to peak up with their tiny fiddle heads, is when you can expect to see the morels. It is also best to seek them after some rain and warm temperatures. This is the method that works best for us. We have spots in NC and VA where morels tend to grow. The VA spots produce larger ones than we normally find in NC, but they are both similar in flavor. A local VA newspaper printed a story on a man finding extra large ones – one the size of a soda can. Two to four inches tall is usually the size we find. And when we have found portions of larger ones, a forest creature beat us to it. I don’t know about you, but I’m not eating anything that something else chewed on first. I also wouldn’t trust myself to know the difference in other types of mushrooms, but there is nothing else in the forest that looks like the morel. It has a distinctive cone shape which we call ‘little Christmas trees’. The inside is hollow and the outside is covered in gill-like formations. They can be dark in color, dark brown or nearly black, or they can be white or grey. But they are unique. There is something called a false morel. Some people take the name to mean another exact replica of the edible morel. But let’s look at the differences. The false morel does have the gill-like outer surface but it is round in shape. It is also solid through and through, lacking the distinctive hollow center that belongs to the morel, and is reddish in color. So if you can tell the difference between round and cone shapes, solid and hollow, and red versus black, brown or white, then I don’t think you’ll have any problems discerning between the two. You can use them like you would any other mushroom. They add a distinctive earthy flavor to sauces and pasta. But our favorite way to prepare them is to wash, slice lengthwise, roll in a little flour, cornmeal, salt and pepper mix, and then fry – either in a pan on top of the stove or in the oven. Horseradish sauce makes a great dip for these delightful morsels. On one or two occasions we have been lucky enough to find large numbers of morels. It’s rare, but can happen in ideal situations. They dry well, using normal methods for drying. I used a food dehydrater and stored them in an airtight container, adding them to sauces throughout the year. 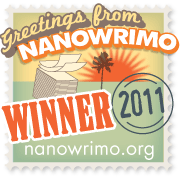 I was spoiled and continue to look forward to the next abundant season. Happy hunting!